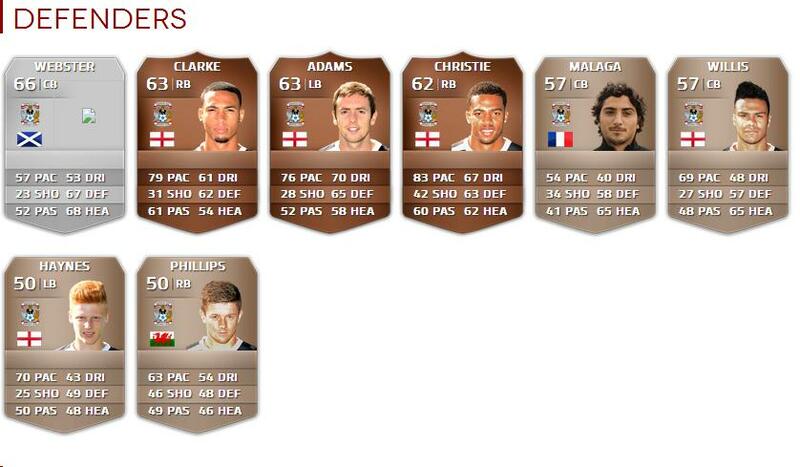 FIFA 14 Coventry City players & ratings revealed. 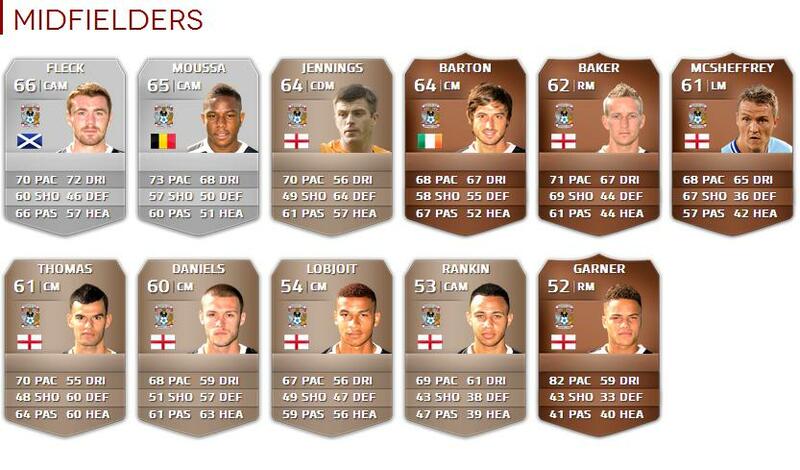 FIFA 14 is just a few weeks away & the demo being released on Xbox 360 and PS3 today, now the Coventry City lineup and player ratings can be viewed. Summer additions Mathieu Manset and Andy Webster have been added to the squad, whilst due to their deadline day exits Gary McSheffrey, Kevin Malaga and Steven Jennings are still with the club, however this will almost certainly be updated with the first match day squad update. Joe Murphy, Andy Webster, John Fleck and Leon Clarke are the highest rated players overall with ratings of 66 closely followed by Franck Moussa with a rating of 65. Somewhat surprisingly, despite 15 goals from midfield last season, and a number of assists, club captain Carl Baker has been downgraded to a rating of 62 from 63 in FIFA 13 rather than upgraded. A number of City players are also making their debut on the game including Leon Lobjoit, Ben Maund and Ryan Haynes. The average overall rating for Coventry City is a lowly 59, although that is due to the high quantity of academy graduates in the squad, compared to last year’s 61. To see all player and team ratings, click here. « Football League ‘Loan Window’ open – possibly for the last time.